Latino Review posted an interesting picture today that could possibly be our first gander of what Whiplash could look like in "Iron Man II". The news outlet cannot confirm nor deny that the image is infact legit (pictured on right), but either way it is pretty cool. If the image is in fact legitimate, it raises a few questions? 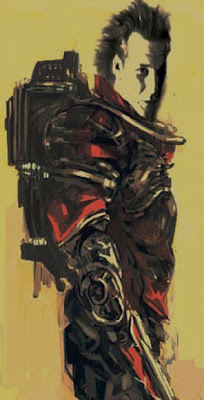 If it is just some fan made art then it can just be dismissed and remembered as a cool image. The biggest question is, that is suppose to be Whiplash? The armor looks much more similair to Crimson Dyanmo than Whiplash (especially with all the red hi-lights). Mickey Rourke is said to be playing Whiplash, but his given character name is Ivan a Russian. 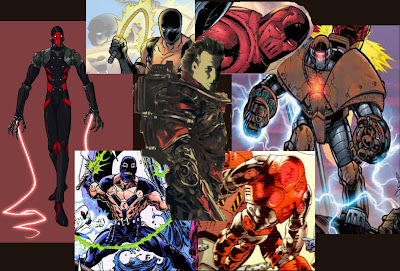 Whiplash was American and Crimson Dynamo is his many incarnations has been Russian. The image, if true, leads me to believe that Rourke's villainous character in Jon Favreau's "Iron Man II" will be a combination of the two characters. Below I've provided some images of the two villains for you to compare.